I’m noticing more people have finally realized that even though “fall back” is supposed to mean an extra hour of sleep, it means just the opposite for those with small children. While everyone else is looking forward to the shift, those of us with little ones know it means absolutely nothing besides now the kids will be up at five instead of six. What I failed to consider was how the evenings would look. We have a baby who goes to bed at six o’clock at night; on a really good night I might be able to keep her up until six-thirty. Now, with the end of daylight savings, I have a baby that really wants to go to bed at five. I know it will only take a few days to get her back to where we were (or at least close to where we were), but today I thought we had hope because she’d taken a third nap and slept until four in the afternoon. Four!! Making it until six should be easy; it’s only two hours! I should have known when she woke up screaming that it wasn’t going to work. 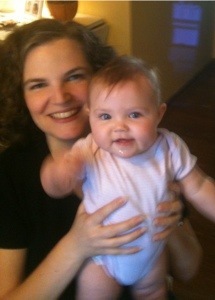 We made it through a very high-maintenance evening (please know, she it not a high-maintenance baby!!) and finally, with dinner over, I was facing clean-up. She was done. DONE. Unfortunately, my husband was done, too, as he was working overtime and had to disappear into his “office” in the basement. I plopped the baby down in the living room with her bucket of toys, handed her a few of them, and kept talking to her as I ran back to the sink to at least get the leftovers put away. Dirty dishes could wait, but I wasn’t risking losing leftovers to a sneaky (and astoundingly agile) dog. Ravioli dished out and put away: check. Garlic bread stacked up and put away: check. Every last pot, pan, and plate piled in the sink away from potential puppy disaster: check. I raced back into the living room, where the baby had never really stopped crying. I took one look at her and every last ounce of irritation melted away from me as I realized she had managed to reach over and around every single toy I’d attempted to appease her with….and grab her blanket. There she sat, thumb in her mouth, blanket pulled to her cheek, tears still running down her face. My poor, exhausted baby! As I rocked her and nursed her that night I thought about how even a six-month-old knew exactly what was most important to her. 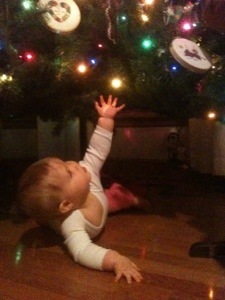 How even she, as an infant, was able to cut through all the “stuff” and reach for the one thing she knew would help. She didn’t want any of that other “stuff;” she wanted That One Thing that was her comfort; that would get her through until her struggle was over. She wanted her blanket. Of the world—they’ve taken wings. This is the song that keeps getting stuck in my head lately, all prompted by a moment that hit last week. It was late morning on a gorgeous fall day, where the weather is unbelievably perfect and the kids had (wisely) elected to do their reading outside. My son came bounding in and excitedly (yes, excitedly!) launched into his description of what was happening in the book he was reading. And that was when I was struck, almost physically, with a growing awareness of the absurdity of the entire situation. I am forty years old, standing in my kitchen, in a county I swore I’d never live in, wearing a baby, listening to my son talk about his reading while his sister reads outside, with homeschool work all over my kitchen counters, and my pharmacist husband working from home in the basement (not in any Walter White way, I swear). Did I mention I was wearing a baby? What’s funny, though, is that I wouldn’t trade this. I love this. I love the kids home, I LOVE the hubby home, I (obviously) love the baby….so while I’m not really sure how I got here, it’s proof that I can trust the One who brought me.